There’s more vector goodies for Access All Areas members to download this week, thanks to another kind contribution from Adrian Pelletier. 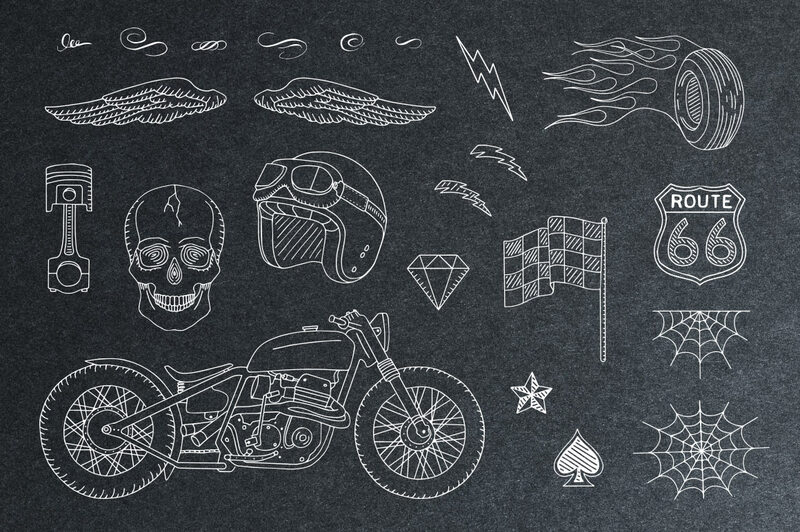 The Hand-Drawn Vintage Racing Elements pack contains 23 illustrated vector graphics that are perfect for posters, t-shirts, branding, and all sorts of other uses. Items include a detailed custom motorcycle, retro helmet, flaming tyre, wings, skull, and a range of decorative elements. Access All Areas members can now download this collection of 23 vintage racing elements as part of their membership. Each graphic is available in editable vector format, high resolution Photoshop documents with Smart Objects, and individual PNG images. How much is a THANK YOU worth? I now officially feel guilty for accepting all these GREAT free files from you and there is nothing I can do in turn to return the favor. Except of course to say THANK YOU…again. Adrian is sure good at what he does! These are cool! I thank you both!